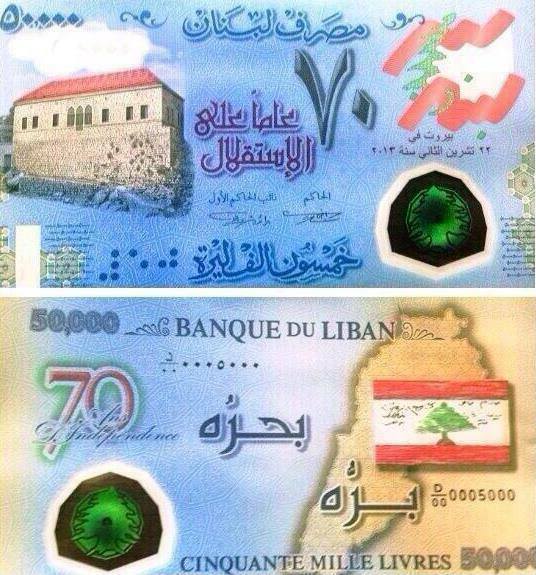 On Wednesday, Lebanese TV station LBCI showed the new 50,000 LBP bill with its all new and sophisticated design which will be rolled out on November 22 (Independence Day in Lebanon). The idea was to commemorate 70 years of independence, and the bill features the first ever Lebanese flag in its current shape and colors, as well as a few of the country’s most important landmarks. It’s been quite a few years that Banque du Liban (the Lebanese Central Bank) has been heavily criticized because of the new bills it has been rolling out, but regardless of all the buzz, people got used to the new bills which grew on them. Now the thing with this new 50,000 LBP bill is that it has an epic language fail: the French word “indépendance” (its English equivalent being “independence”) was actually spelled as “indépendence”! Social media is exploding with all kinds of memes, jokes and posts about this outrageous fail which we will have to endure and live with for many years to come. The Lebanese people have always been known for laughing their way out of any sad situation, but this is a serious case we have here. We are laughing about it, but there must be something we can do to fix it! I wonder how such a very obvious mistake was left unseen by all the supervisors and people who took a look at it before it was granted final approval. It shocks me because we Lebanese pride ourselves with our excellent language proficiency (French, English and our mother tongue Arabic). This is not a billboard, a brochure or a restaurant menu. This is a bill to be issued by the Central Bank for God’s sake! It is crazy and unbelievable how one single letter, one tiny little vowel, can cause such a huge mistake, leading to an unimaginable amount of denunciation! Mr. Salame, please do something about this before any further damage is done. This is not to be taken lightly, and you cannot just ignore the reaction of all the outraged Lebanese intellectuals. This is not how matters are handled. You are known for being a professional. Please take this bill down and issue an amended one now, right now. You have eight days, I know it can be done! – First of all, since when is an independence anniversary celebrated on a banknote? That’s the kind of thing you print on a postage stamp, not on a banknote! – Plus, why is the “70” (number of years since the so-called independence), printed so much larger than the “50,000” which is the denomination of the note itself? At first glance I thought this was a 70 L.L. banknote. – And what independence are we talking about, anyway? Has Lebanon really been independent for 70 years? – I am not going into the typos (use of a comma instead of a dot, and use of an e instead of an a); Those are sufficiently covered by the media (e.g. the Daily Star article above). – Why wasn’t this horrific design disclosed to the public in advance? Normally you would invite comments and gauge the public’s reaction before commissioning and printing something of this importance! – And finally: It would be nice for the public to know who in Lebanon is profiting from this business deal with the printer. How much money as an already-rich corrupt official pocketed from this? First of all, thank you for your comment and all the points you raised. Second, I didn’t want to go there. I run a language services business and I just discussed the linguistic part of the issue. However, I do agree with every single thing you said. I had the same thoughts, especially regarding the huge 70 which is confusing on a 50,000 LBP banknote, not to mention the clashing of colors. It’s like a freaking circus! I just tried to keep my comments strictly related to the language mistake but there, I said it! Let’s hope for some true change in this beautiful country which, no matter what, we love unconditionally! can i know your name admin? because i want to use it in my project about media and ethics and i wanna talk about this article thank you.